Lebanon, Indiana is known for sense of community. Lebanon has wonderful sense of family and famous for its small-town charm. People here care about each other. Whether it’s getting neighbors the services they need, celebrating during one of the city’s quality of life building events, Lebanon feels like home. The festivities have become a tradition with Boone County residents, their families and friends. We are the only county in the state of Indiana that provides a weeklong celebration for the 4th of July. The excitement and energy around these events draws thousands of visitors from around Indiana and beyond. Our festival is one of the finest observances in the state. The Little Black Box Theatre Company was created by Emily Wolfgang in the summer of 2012. The group sought to create a better theatre education environment in Lebanon, IN. Boone County Cancer Society is a non-profit 501(c)(3) organization which assists any cancer patient residing in Boone County. We provide direct financial assistance for any cancer related bill including: prescriptions, cancer treatments and doctor visits, transportation to and from treatments, wigs, bras, and any other cancer related medical necessity. We do all we can to help. Center Stage Community Theatre of Lebanon, IN, has been producing high quality theatrical performances for the last twenty one years. To date we have produced more than 80 plays, comedies, dramas, mysteries, and satires. Since 1991, the Community Foundation has granted over $20 million back to Boone County. By our community, for our community – forever. The Heart of Lebanon initially formed as the nonprofit arm which would to work with the Office of Community and Rural Affairs. As part of this process, Lebanon’s downtown has been designated as an official Indiana Mainstreet in January of 2016. 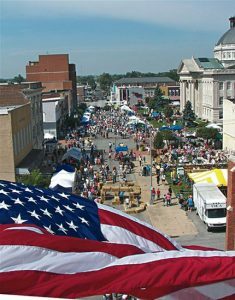 The Heart of Lebanon remains active both with OCRA and as a 501(c)(3) organization to foster the revitalization and reengagement of the downtown as the cultural center of Lebanon, Indiana. Lebanon Ballet School offers top quality dance instruction led by Director Marylou Hume and her husband, Don Steffy. The school specializes in ballet, but also offers tap, hip hop and jazz. Love In the Name of Christ of Boone County is a unique network of churches and agencies that respond to needs of ordinary people who need HOPE in the midst of a difficult time in life. As Christians, we believe that genuine hope comes from a relationship with Jesus Christ. (I Peter 1:3-4) Unexpected events like the loss of a job, a serious health diagnosis, a failed relationship, or a major home repair can sometimes cause major disruptions to normal life. Hundreds of volunteers are mobilized to care for and walk with people through these challenging times. Providing various services to people of all ages. Boone County’s only local radio station. Radio Mom offers an excellent variety of great music, important news updates, and informative interviews. Here at the Lebanon Community of Shalom our mission is to impact the people of Boone County by feeding bodies and encouraging the spirit. Our vision is to feed our community so that one day no one will ever experience hunger. The Talent Factory is a place for children and adults to learn, create, and grow through arts & dance.The Talent Factory’s performing arts programming is diverse, serving a wide distribution of ages, and attracting audiences of varying artistic sensibilities. Founded in 1924 by Henry Ulen, Ulen Country Club in Lebanon, Indiana has provided its members with an enjoyable club experience that includes fine dining, social events and, of course, a championship golf course designed by nationally known course architect, William H. ” Bill” Diddel. Our mission at Witham is to improve your health through excellence and personalized care. Every day, the accomplished and experienced staff, compassionate nurses and team of dedicated professionals, combined with our state-of-the-art-technology, bring exceptional health resources to patients and their families – all close to home. At the Witham Family YMCA, strengthening the community is our cause. Every day we work side-by-side with our neighbors to make sure that everyone, regardless of age, income, or background, has the opportunity to learn, grow and thrive.